Trinitarian apologists still try to duck and weave and obfuscate in their attempts to deny the clear evidence of the Sahidic (and Bohairic) Coptic translations of John 1:1c. Not being proficient in Coptic themselves, they have appealed to certain experts, but have resorted to a "pick and choose" tactic in presenting the conclusions of those experts. But they then drag their theological suppositions and 'may be's into the equation to plead for a "qualitative" reading, since they can by no means get a definite meaning out of Coptic John 1:1c. They cannot make it say "and the Word was God." 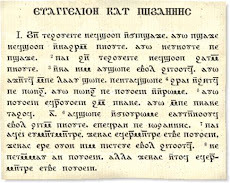 "For my part, I think both 'a god' and the 'qualitative' idea are special pleading; yes, there is an indefinite article there; but Greek doesn't have an indefinite article, and Coptic grammatically requires one for a construction like this; but to translate 'a god' or 'the word was divine' seems out of kilter with what the Greek looks to me to be saying." We have three things mixed up here: Greek grammar, Coptic grammar, and what "seems" to be or "looks" correct according to Dr. Choat's presuppositions. And if he is not satisfied with either an indefinite or a qualitative reading, that leaves the definite reading, which is clearly ruled out by both the Coptic verse and a careful examination of the Greek verse at John 1:1c. But what truly matters here is the Coptic grammar. It cannot be overlooked that in fulfilling what "the Coptic grammatically requires" at John 1:1c, the Coptic translators actually used the indefinite article, not the definite article. And, of course a Coptic indefinite meaning would naturally employ the Coptic indefinite article! In English translation, that indefinite construction is customarily translated by an "a". There are numerous examples of this fact in the English translation of the Coptic New Testament by Dr. George Horner, as well as modern English translations of other Sahidic Coptic literature. It hardly matters here that Koine Greek does not have an indefinite article; Sahidic and Bohairic Coptic do have the indefinite article, and it is used to form an indefinite construction, not a definite construction, at Coptic John 1:1c. "Well, this is a really old hoary chestnut of a question; but many of the answers given over the years (or centuries?) seem more theologically driven than actual argument over the grammar. There are *many* posts on the B-Greek discussion list (archived and easily findable in Google) which deal with the issue, which you may be interested in perusing." To those 'theologically driven answers' can be added the attempts of Trinitarian apologists to muddy the waters by trying to explain away what Coptic John 1:1 actually says. Choat refers to the grammar as the proper consideration in understanding John 1:1c. What does the grammar tell us? Apparently, it is only at Coptic John 1:1c that the meaning of a Coptic indefinite construction is contested by Trinitarian apologists, not at any of the other verses of similar Coptic construction. Why? Because it is inconvenient for Trinitarian dogma to "hear" the verse for what it actually says, ne.u.noute pe p.Saje: "and a god [or, a divine being] was the Word." This obfuscation and muddying of the hermeneutical waters is precisely what these apologists have done with the Greek of John 1:1c as well, as can be seen in some of the B-Greek posts that Dr. Choat mentions. So it is really no surprise that they attempt it with the Coptic. The Coptic version of John 1:1c does not support their theology, so they must bend and twist it until it comes at least close to what they want it to say. All of these verses have anarthrous nouns in the Greek text, that occur before the verb. George Horner's English translation of the Sahidic Coptic version employs the English indefinite artice "a" in these instances, and he does not enclose the "a" in brackets, as he does at John 1:1c, which should likewise be rendered: "and a god [or, a divine being] was the Word." English translations directly from the Greek also customarily employ the indefinite article "a" in the verses in the table above, and correctly so. It is quite clear that there is no grammatical impetus to rendering Coptic John 1:1c as anything other than indefinite. This Coptic sentence is not syntactically "qualitative," nor is it definite in construction. Those who argue otherwise have the burden of proof to show where this "qualitative" or definite significance occurs elsewhere with the indefinite construction of count nouns like Coptic noute ("god") in the Coptic New Testament. 1- Not one of the scholars cited by them denies that "a god" is an accurate translation of Coptic ou noute, as at Coptic John 1:1c. 2- Not one of the scholars cited by them demonstrates by the example of New Testament verses that "a god" is an incorrect translation of Coptic John 1:1c. 3- Not one of the scholars cited by them demonstrates by the example of New Testament verses that Coptic ou noute is qualitative rather than indefinite. Some Trinitarian apologists also resort to general statements about certain aspects of Coptic grammar that, while true in those instances, do not even apply to John 1:1c. For example, the assertion that the Coptic indefinite article does not correspond exactly with the English indefinite article. But this is irrelevant with count nouns like Coptic noute, (god) which is the specific word used at John 1:1c. Such nouns, when in indefinite construction are, indeed, customarily rendered with the indefinite article (a) in English. The bare assertions of Trinitarian apologists cannot be accepted. If they are going to make weighty pronouncements, they should back them up with clear examples from the Coptic New Testament, not merely by what "seems" to them to be the case, "maybe."